Essential services are provided to the public in many cases by private and voluntary provider organisations. The latest in a line of reports by the Committee on Standards in Public Life says there has been little real progress on measures to reinforce ethical standards in outsourced public services and calls for a consultation on whether the Freedom of Information Act should apply to private sector providers where information relates to the performance of a public service contract. "From waste disposal to health care and probation services, all kinds of public services are routinely supplied to many of us by private or voluntary sector organisations, paid for with public funds - accounting for almost one third of government spending in 2017. "The public is clear that they expect common ethical standards – whoever is delivering the service - and that when things go wrong there is transparency and accountability about what has happened. 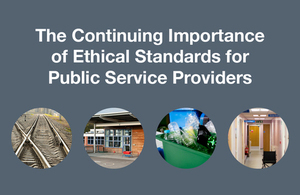 "Our report in 2014 looked at departmental commissioning activity and the ethical standards of service providers and made a number of important and straightforward recommendations to enhance the government’s capability to commission services from providers who focus on high ethical standards in service delivery. "Today’s report shows that, disappointingly, very little progress has been made on implementing these recommendations and evidence shows that most service providers need to do more to demonstrate best practice in ethical standards. "In particular, we remain concerned over the lack of internal governance and leadership on ethical standards in those departments with significant public service contracts. Departmental and management boards spend little, if any, time considering ethical considerations and tend to delegate such issues ‘down the line’. Those involved in commissioning and auditing contracts remain too focused on the quantitative rather than the qualitative aspects of their role. And departments lack clear lines of accountability when contracts fail. "While many service providers have developed a greater awareness of their ethical obligations in recent years, partly due to the high-profile failure of some organisations to adhere to these standards, some remain dismissive of the Nolan Principles or adopt a ‘pick and mix’ approach, which is not in the public interest. And many service providers continue to expect that setting and enforcing ethical standards remain a matter for government alone. "The Committee remains of the view that more must be done to encourage strong and robust cultures of ethical behaviour in those delivering public services. To that end, the Committee reaffirms the recommendations made in its 2014 report and has made a further set of more detailed, follow-up recommendations to address particular issues of concern. "In particular, the Committee calls for service providers to recognise that the Nolan Principles apply to them, for greater moral courage among key financial and other professionals in securing and maintaining high ethical standards, and for consultation on the extension of the application of the Freedom of Information Act to private sector providers where information relates to the performance of a contract with government for the delivery of public services.